There is increasing pressure on the governments in Europe to allow commercial aircraft flights to resume, because of the financial hardships they are suffering. At the same time the impact from the absence of teachers and students in classes, as they resume after the Easter break, has caused some additional problems around the UK. Unfortunately just having commercial companies take jets up and fly them around for a while, does not necessarily prove that the skies are completely safe. There is also a little discrepancy between the commercial company reports of no damage to their planes, and the damage to a Belgian F-16 plane that came back with deposits in their engines (this is separate from the Finnish F/A-18 problems). The build-up of melted ash can be seen on this borescope picture of the inside of one of the Finnish engines. The deal that has been developed with break the airspace into three separate parts, that which remains closed, that which is restricted and that which is open, based on the conditions in different zones. The problem now will come in determining and maintaining the records of what the conditions are like along different flight paths, so that pilots and airlines can make the best judgment of how, where and if to fly. The process cannot be left to the pilots since it is very difficult to discern when the particle cloud reaches a level of intensity that can cause problems. The melting of the ash particles so that they coat the inner parts of the engine, possibly closing off critical openings in the engine are the most common problem that a plane will apparently encounter in a brief exposure to the ash cloud. It is not, however the only problem. A 747, for example, flies at a cruising speed of 567 mph. This converts to 830 ft/sec. At these particle velocities there is an entire commercial industry out there that uses such particles, in a waterjet stream, to cut through a wide range of materials. As an illustration, this is a half-inch thick piece of titanium that one of my graduate students cut using such a system. The jet was travelling across the piece at a speed of several inches a minute, and cutting all the way through (the cut was made fairly slowly to ensure an acceptable surface finish). In steel when running a standard quality test the jet of abrasive, which carries about 0.8 lb of abrasive particles in every gallon of water, will cut to a depth of about 1.75 inches at a cutting speed of 1.5 inches/minute. Half-inch thick titanium sheet cut through by abrasive slurry jet. (The face visible if that which was exposed by the cut). If the impact speeds are higher, then it is not necessary to have particles in the water, though that generally requires higher impact velocities. (There is this story about Andy Fyall of the Royal Aircraft Establishment - Farnborough, a Concorde and a typhoon that I don’t seem able to find on the web! But I remember it from an early ELSI conference). 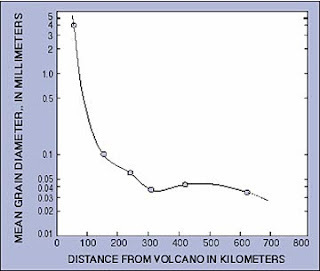 The particles that are used in cutting are quite small (they typically come out of orifices that are smaller than 0.03-inches) but they are quite densely packed in the jet, relative to those encountered in the plume of a volcano, but at high speed it does not take that many to start to do damage. 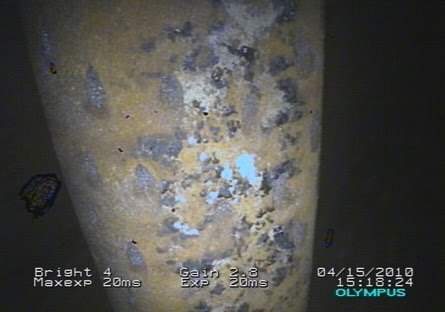 Damage is reduced, however, at particle sizes below 100 microns, (0.1 mm). So the question is, how big are the ash particles? While there is not enough data yet on the current eruption particles, there is some from the eruption at Mt St Helens. The particles that will travel furthest appear to be mostly in the 50 micron and below range, though 100 km from the volcano there will still be 100 micron particles in the cloud that could be significantly damaging. (Respirable particles are down in the 5-micron range). The question thus remains as to how to tell if the particles are there in sufficient density to cause problems. And so far there is not a lot of consensus it appears on how that determination will be made. The problem also arises in determining at which height the plume is going to be, since the varying intensity of the eruption has been ejecting material to different heights. More recently higher clouds have obscured the plume, on occasion, from satellite view, which is partly because the intensity is, perhaps temporarily perhaps not, decreased. There are, unfortunately a lot more things that we don't know, as yet, about the eruption, that will only be determined with time. Thus it seems a little better to proceed with caution at this point, until the techniques for establishing what is safe, and what not, have been clearly established.